Despite high expectations, the University of Georgia Lady Bulldogs unfortunately made their exit in the second round of this year’s NCAA Tournament. For graduate student Haley Clark, who is the 2018 Arthur Ashe Jr. Female Sports Scholar, these were the final basketball games of her outstanding collegiate career. Throughout four years at Georgia, Clark has been a teammate, friend, scholar, motivator and leader. Women’s basketball head coach Joni Taylor says coaching Clark — team captain and a starter the last two years — has been a blessing. Clark acknowledges that she has always been highly driven with a strong work ethic, and thanks her parents for nurturing that. As a teenager, she completed all of her high school’s advanced placement courses, so, during her junior and senior years, she attended morning classes at a local community college. 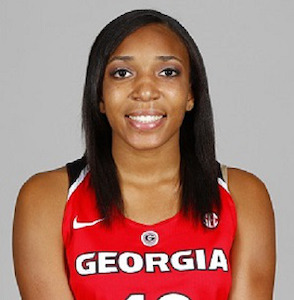 She admits that, during her years at Georgia, she sometimes sacrificed sleep to ensure that sufficient time was spent at practice, in the gym on individual workouts and studying. Honors have included SEC Academic Honor Roll, Caterpillar Student Athlete of the Month and J. Reid Parker Director of Athletics Honor Roll. Teammates come to her for study tips. Sitting on two prominent student-athlete groups, LEAD (UGA Athletic Association Student-Athlete Leadership Academy) and SAC (Student-Athlete Advisory Committee), community service has also figured prominently in Clark’s life. In 2017, she was one of 19 Georgia student-athletes who went to Costa Rica as part of Soles for Souls, a nonprofit organization that collects new and used shoes and redistributes them to people in need. Heather LaBarbera, director of student services, says there was never a doubt that Clark would participate in this first service-learning trip for Georgia student-athletes. Other community activities include Bike Build, for which Clark has helped collect, organize and build bicycles for young people in need. She recently got involved with the Clarke County Mentor Program in Athens, Georgia, which matched her with a student at a local elementary school. For Taylor, the end of Clark’s playing is a sad thought. After three years as point guard, for her senior season Clark switched to combo guard (playing point and shooting guard) and spent time mentoring the team’s freshman point guard. “I don’t know what we’re going to do when she leaves,” says Taylor. For at least the next year, Clark will be close at hand as she interns in the business office of the athletic department, while finishing her master’s degree. She describes herself as always fascinated by math and finances, even creating spreadsheets for her teammates so they could learn about budgeting. Heading into her professional life, Clark takes with her the leadership, sense of responsibility and communication skills she developed as a point guard. Playing on a team has helped her understand how to build common ground and succeed in challenging situations. Long-term, she is open to possibilities. She is interested in financial planning for professional athletes, but she may shift gears and pursue athletic administration. It is likely more accolades will come, but whether or not they do, Clark will push herself to be the best. This article appeared in the April 5, 2018 issue of Diverse magazine.